Chicken and Spinach is very good combo. Chicken has high protein and spinach is very good source of fiber.. which makes the combo a "hearty meal". I learnt this recipe from Sanjeev Kapoor's Khana Kazana. He is great chef, I love his TV shows. 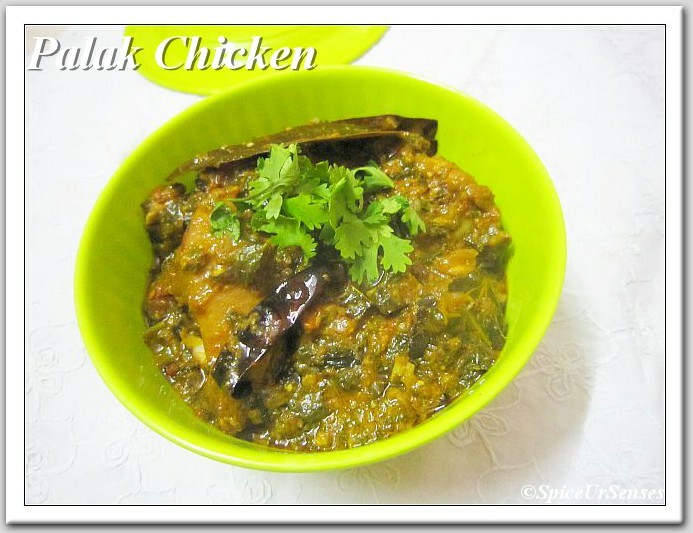 Chicken palak, its easy to make recipe and tastes so good. This is usually available in restaurants as Saag chicken. I made this chicken palak for the first time and it was tasting very good... You can try and see..
Wash and finely shread spinach, chop onion, ginger and garlic and keep aside.Heat oil in a thick bottomed vessel, add peppercorns, bay leaves, cloves, cardamoms and sauté for a minute. Add finely chopped onions, ginger garlic paste and sauté till onions turn light brown. Add chicken pieces, cumin powder, coriander powder, red chilli powder, turmeric and garam masala and a little salt. Stir-fry for a minute, add one tablespoon of yogurt. Stir-fry for a minute, add one more tablespoon of yogurt. Repeat this till all the yogurt has been used up and the chicken turns light brown. Add spinach and a little more salt to taste. Mix well and stir-fry till the spinach gets well mashed. Cover and cook till the chicken is tender and cook till the gravy is thick. Palak and chicken gravy looks very yummm. My mom prepares this with mutton. Loved your version. 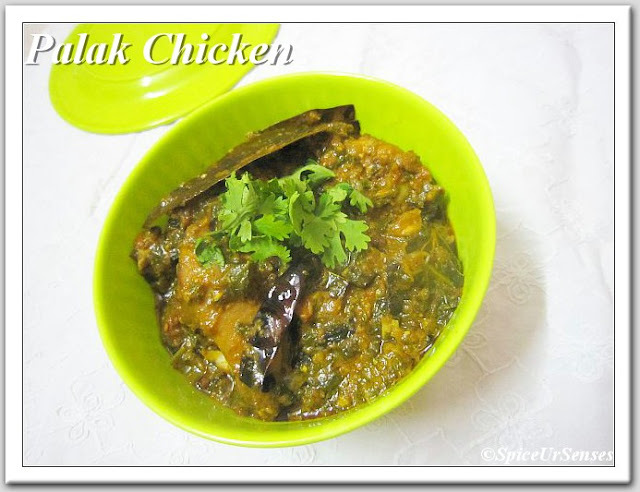 Delicious palak and chicken gravy,yumm! Delicious Combination .. Looks so yummy !! Palak and chicken looks to be a yummy preparation. so flavorful and yummy chicken..!!!yumm!! Very inviting and delicious gravy !!! I love greens in anything that i eat and this is great curry Rumana..
Palak and chicken gravy looks delicious. look so colorful and mouthwatering. Delicious combination,looks so inviting,makes me drool.